Two suspected Lashker-e-Tayiba terrorists were killed and two policemen injured in a nearly 20-hour-long gunbattle in a locality in the outskirts of the city here which ended on Monday evening. "The encounter at Ahmadnagar locality of Buchpora ended with the killing of both the terrorists holed up in a residential house," a police officer said. He said charred bodies of both the terrorists were recovered along with two AK rifles and some ammunition from the house which had caught fire. The officer said the slain ultras were believed to be members of LeT and efforts were on to establish their identity. The gunbattle had started on Sunday evening when the police, assisted by security forces, launched a search operation following specific information about presence of terrorists in the house. A policeman was injured in the initial gunbattle but the operation to neutralise the militants was suspended to ensure safety of civilians, including a couple in whose house the terrorists had taken shelter, the officer said. After night-long lull, the encounter resumed on Sunday morning after the ultras let go the house owner Abdul Majid Rangrez and his wife trapped with them, he said. The officer said the holed up terrorists refused to surrender and continued intermittent firing on the security forces during which another policeman was injured on Monday. After night-long lull, the encounter resumed on Sunday morning after the ultras let go the house owner Abdul Majid Rangrez and his wife trapped with them, he said. The officer said the holed up terrorists refused to surrender and continued intermittent firing on the security forces during which another policeman was injured on Monday. The security forces tightened the cordon around the house while evacuating civilians from adjacent houses. They moved cautiously to avoid any collateral damage since Rangrez and his wife were inside the house, the officer said, adding the militants let go the couple -- first the wife and couple of hours later the house owner. The security forces then launched the assault to neutalise them. This was the second major encounter in the valley in as many days. 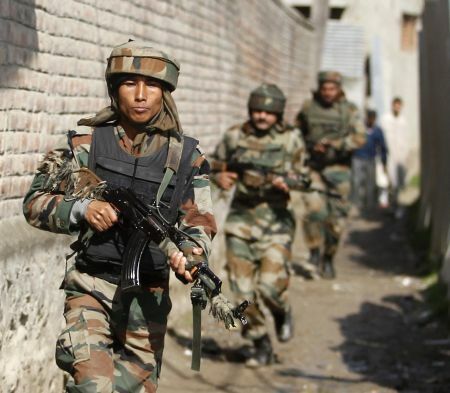 Two unidentified terrorists and two policemen were killed at Khrew in Pulwama district of south Kashmir on Sunday in the first attack on election-related activities in Jammu and Kashmir since the schedule for Lok Sabha polls was announced last month.